These small, round, bright-red berries are more tart than sweet which makes them a perfect accompaniment to roast meat and dinners bringing a nice bright dash of Christmas red to ones plate. This week we look at how these North American fruits have become part of Christmas, gained status as a superfood and the many ways they can be enjoyed throughout the holidays and year-round. Cranberries are one of the only three fruits native to North America that are commercially known and grown…the others being blueberries and Concord grapes. Native Americans had historically used cranberries as a food, medicinally and as a dye when they are thought to have introduced them to the starving Pilgrims in colonial Massachusetts. Since the 1930s the cranberry bogs have been wet harvested which is more efficient and gathers more cranberries. Cranberries have little air pockets inside of them and when the bogs are flooded with water, they come loose from their vines and float to the top where they are collected. It is such a beautiful sight to see a cranberry bog go from its orange-y brown autumnal colour scheme to a bright red carpet. The mechanised process yielded more berries but some that were too blemished to sell at market and thus the canned cranberry sauce was perfectly primed to expand from what until that point had been a small market. Today, only 5% of cranberries are sold fresh, the rest are turned into sauce, juice, frozen or dried. 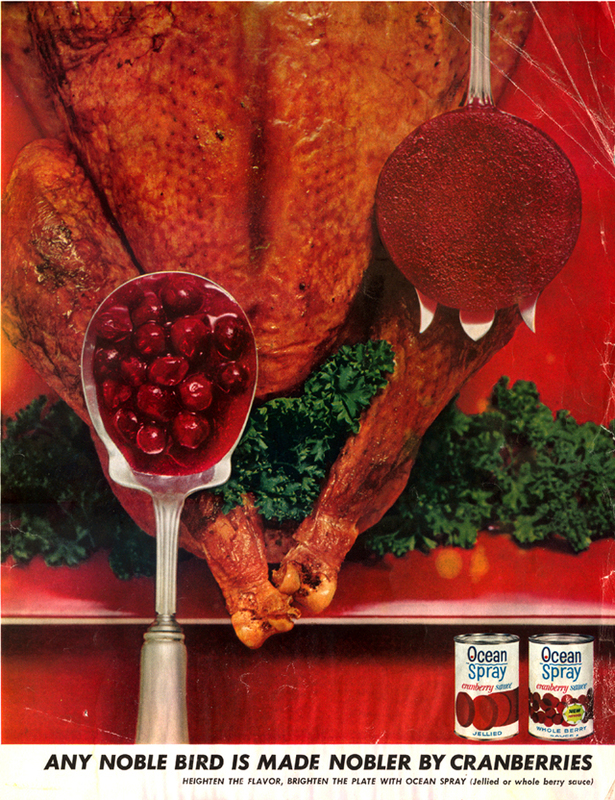 Cranberry sauce was marketed in the canny advertising campaigns in pre-WWII America as the must have accompaniment to turkey on Thanksgiving Day. Eating cranberry sauce is a tradition that has been adopted in the UK. Perhaps this coincides with another imported American tradition, that of eating a roast turkey on Christmas day rather than a roast goose which had previously been the traditional meal for Christmas dinner. Cranberries have anti-inflammatory properties, can prevent UTIs, prevent certain types of cancer, they are beneficial for respiratory and heart diseases. There are the cranberry sauces that escape their tin in one smooth wiggling jelly moulded in to the shape of their tin. There are lots of other styles and consistencies of cranberry sauce on offer and the availability of fresh cranberries in November and December there’s no excuse to not give a homemade sauce ago ahead of time. Fresh cranberries are great to make sauce, chutney and then there are plenty to add to puddings, cakes or make sweet compotes. A hot little tip that I have is that if you go to the supermarket the day after Boxing Day you will probably find bags of fresh cranberries reduced heavily in price. I will buy as many as they have and make a large batch of cranberry chutney which is terrific on sandwiches all year round. For a simple cranberry sauce take 500 grams of fresh cranberries, add the juice and zest of one lemon, 1 Tbsp sugar, a pinch of salt and some freshly cracked black pepper and stir over low hea until the cranberries soften and release their juice, you may even hear a little pop. Place your sauce into sterilised glass jars and the sauce will keep for up to a week. You can make it prior to Christmas and it will go great with all leftovers or cheeses. Place chopped onion in a large saucepan, add the sugars and cook for five minutes over low heat until the sugars are all dissolved. Add cranberries to the mixture and stir well. Add all the spices, molasses, ginger and garlic to the mixture and stir well. Add the orange juice, zest, port and wine, stir well and cook over medium heat until thickened or for roughly 40 minutes. Once thickened, remove from heat and place into sterilised jars, lid and leave to cool. Jars will keep for a year . Once opened, keep in the fridge and eat within two weeks.